Seeing your name in the phone book used to be the ultimate, I remember it clearly. As a boy, I dreamed of the day when I would have the independence, stability, maturity, and home phone to be listed on page “L” alongside my fellow human adults. I’d crack open the new Yellow Pages, thumb through the Lees, and lo and behold, there I’d be. A celebrity. My Yellow Pages dream has vanished. Now it’s all about Google. I want my face on a Google search results page. The ticket to my desired Internet listing is Google authorship, a highly effective way of connecting and promoting content on search results pages. It’s free to use, easy to set up, and worth the effort—especially for us who dream the Google dream. Google authorship wasn’t always Google authorship. It began as Agent Rank. 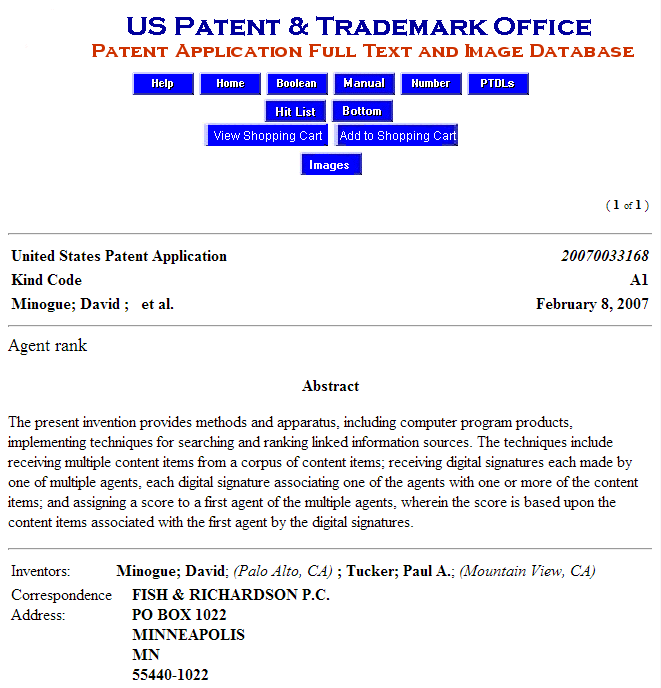 In 2005, Google filed a U.S. patent on Agent Rank, a system that would allow the content of expert authors to rank higher in search results pages than the content from less credible authors. In many ways, this was to be the foundation for today’s Google authorship. But Google needed more than just its so-called Agent Rank. It needed an identity platform to manage and discover these trusted authors. You probably know where this is headed. Google+ became that platform. Promoted as a sharing network, Google+ also provided the structure to move forward with Agent Rank, which came to be known as Google authorship. Google+ gave authors the ability to verify identity, manage their personas, and establish authority. In turn, this gave Google the ability to improve search quality. And thus, authorship was born. 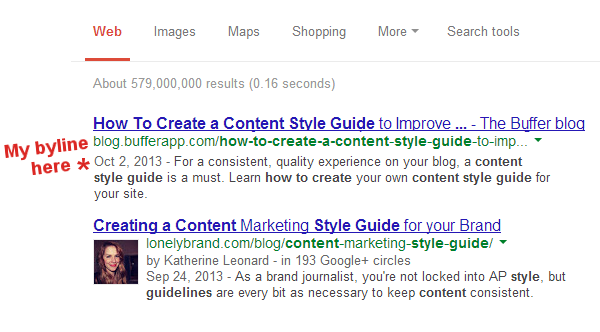 To the naked eye, Google authorship is the photo and byline that appears on search results pages. It is that and so much more. Yes, the photo and byline are the obvious implementations of authorship. These so-called “rich snippets” of information show the author’s profile picture (taken from his or her Google+ account), full name, and the number of Google+ circles he or she belongs to. 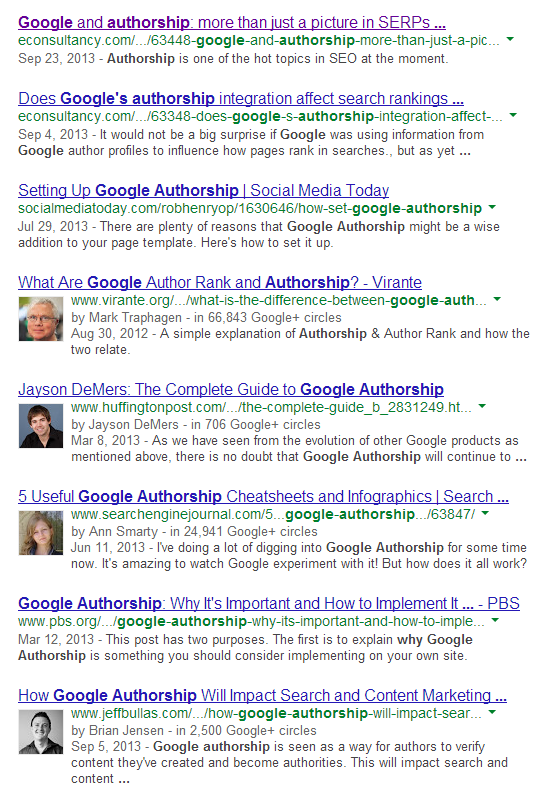 Below is a search results page for the term “Google authorship” showing many entries that have taken advantage of authorship (ironically, some results for “Google authorship” don’t contain authorship rich snippets). In addition to the byline, there is a strategic layer to Google authorship. The tie-in with Google+ profiles creates verified connections between content on the web and the creators of the content. This gives Google the ability to identify quality, human-created content and distinguish it from content that isn’t quite up to par. So yes, authorship deals with pretty pictures and bylines, but it also adds value to search results and content. For the content creator (that’s you! ), Google authorship is a slam dunk. The benefits are vast in terms of visibility, authority, influence, clicks, and conversions. Let’s start with the aforementioned byline. 1. Your authorship byline will get you noticed. 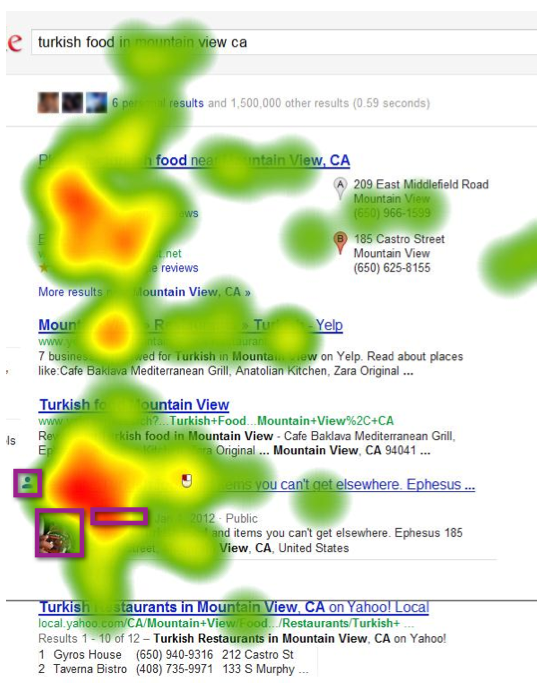 Look at the below heatmap generated by eye-tracking studies. As you might expect, the top results on the page get a lot of looks, but so too do the results with rich snippets (and not so much for the results in between). Photos are eye-grabbing. The research proves it. The uniqueness of the information in a rich snippet helps the entry stand out on the page, and the logical next step to higher visibility is higher clicks. Research proves this, too. 2. Entries with rich snippets have higher click-through rates. The greater visibility and authority afforded by rich snippets in search results are significant factors in whether or not someone will click. How significant? A study performed by search marketing firm Catalyst found that clicks improved 150% with Google authorship. Wouldn’t we all be interested in a clickthrough report like this? Entries with rich snippets are more attractive, engender greater trust, and—as these results show—lead to greater clicks. I know that I always look for an author photo when I’m researching on the web, and it would appear I’m not alone. 3. Authorship is an advantage to the little guy. As evidenced by the heatmap illustration above, the specific rankings where your content lands on a search results page matter less than usual when authorship is part of the equation. For example, if search result No. 5 attracts more eyes than search result No. 2, where would you rather be? The value is on clicks, not placement. For this reason, authorship is key for low ranking pages. Another advantage for us little guys is this: Authorship offers a competitive advantage. A recent study found that only 3.5% of Fortune 500 companies are actively using authorship. Until they do, they are giving a big opportunity to the rest of us. 4. Authorship may be the future of search. Don’t take it from me. Take it from Google’s Eric Schmidt. He sees a future where identity plays a big part in search results. Google offers instructions for setting up authorship on the blogs where you contribute. The instructions are sparse, so consider their version the Cliffs Notes and mine the unabridged. Here is what it took to get signed up for Google authorship on my contributions to the Buffer blog. So far so good? Now it gets tricky. 4. Have an email address on the same domain as your content. I wanted Google authorship on the posts I contribute to the Buffer blog, but the problem is I don’t have a Buffer email address. If I had kevan@bufferapp.com, this process would be a cinch. You simply enter your email on the Google instruction page, and Google makes the connection for you. Since I don’t have an email address, I went to option 2. It was a bit more complicated. 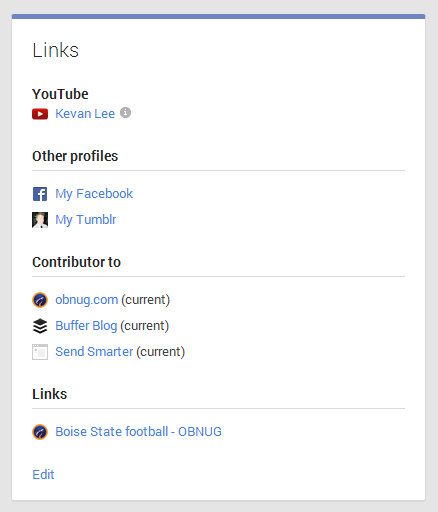 First, I needed to create a link to my Google+ profile from my content. The ideal place to do this was in the author bio that appears at the end of each post on the Buffer blog. Prior to my authorship quest, the last line of my bio—“Come find me on Google+”—wasn’t there. To add it, I logged in to the writer panel on the Buffer blog and went down to my profile settings. The Buffer blog runs on WordPress, so I’m happy to say that finding and changing my profile was a snap. The most important part of this process was following Google’s guidelines for linking to a profile. You must append a tag onto the end of your Google+ URL. The appended version must contain “?rel=author” at the end. Adding this extra line to the URL lets Google recognize me as an author and alerts search robots to check for Google authorship. Step Two in this process is updating the Google+ profile itself. In addition to the content, you must also list on Google+ the sites where you contribute in order to get authorship to work. Think of it as a tiny system of checks and balances. 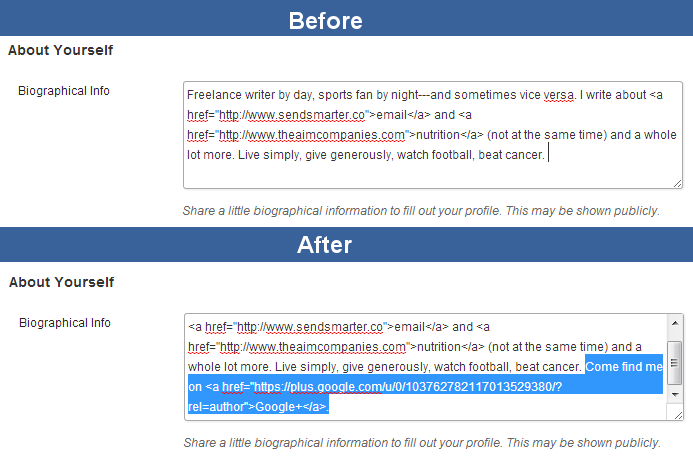 To update Google+, you need to edit the About section on your Google+ profile and the contributor links specifically. There is a small edit button in the bottom left corner of each information card on your profile. Click on the one for “Links,” and you are taken to the links editor. Here you can add the sites where you contribute. 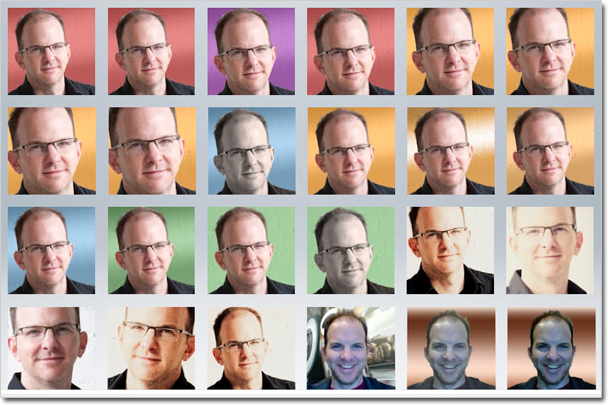 Not long after I did this, my Google+ profile picture was showing up beside the posts I had written on the Buffer blog. Voila! I am Google famous! Setting up authorship is a big first step, and it should come with some positive results in clickthroughs and influence. If you want to go even deeper, you can play around with even more optimizations. 1. Find the perfect profile picture. Cyrus Shepherd of moz.com did not have a good Google+ profile picture (his words, not mine). So he went to work on changing his profile picture to something more professional. He had a photographer friend snap a high-quality photo, and then he tinkered. And tinkered. And tinkered. By his own admission, it was a little “obsessive,” but here’s where it gets good: Cyrus saw a 35% increase in clickthrough rate with the better picture. What’s the right profile picture going to be for you? Some would argue that it’s not your company logo, though you should test to be sure. Other than that, there is no formula. Aim for professionalism and quality and test the rest. My next authorship step is changing out the old image on my Google+ account with something more professional (which would be just about anything at this point). I’ll be happy with half the clickthrough increase as Cyrus. 2. Grow your influence on Google+. As you’ve noticed, the rich snippet on each authorship result includes a mention of your Google+ circles. All things being equal, would you rather clickthrough to an article written by a person in 64 circles (me) or someone in 49,000 circles (CopyBlogger’s Brian Clark)? For this reason, you might find it important to invest some time into growing your personal brand on Google+. Buffer now offers Google+ scheduling, so you have an added resource there. The Google search results page is a beautiful menagerie of links and blurbs and information and value, and any advantage your content can get in order to rank higher is worth pursuing. Google authorship is a clear advantage. With authorship, you receive a boost in visibility, clickthroughs, and influence, and you get ownership over what you create. Set up is straightforward, and the potential is huge. If Google+ has been on your backburner, at least take advantage of the authorship feature to claim the content you create. You’ll be glad you did.